Jupiter's icy moon Europa, as seen by NASA's Galileo spacecraft. SAN FRANCISCO — There's a good chance that NASA's highly anticipated Europa mission will do much more than just fly by the ocean-harboring Jupiter moon. NASA has already selected the nine primary science instruments for the Europa spacecraft, whose core mission involves performing dozens of flybys to gauge the Jovian satellite's life-hosting potential. But the probe should be able to accommodate an additional 550 lbs. (250 kilograms) of payload, and NASA would rather not let that "excess" go to waste. Researchers are studying these various possibilities, and will present their findings to NASA Headquarters "in the January time frame," Green added. Scientists are eager to learn if Europa's huge subsurface ocean harbors alien life. See how Jupiter's icy moon Europa works in this SPACE.com infographic. There's no guarantee that any additional instruments or miniprobes will make it onboard the Europa spacecraft. But the smart money may be on one or two ultimately being selected. "We're pretty hot on doing something," Green told Space.com after his presentation. 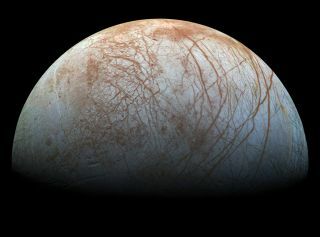 The 1,900-mile-wide (3,100 kilometers) Europa is regarded as one of the solar system's best bets to host alien life. Though Europa is covered by an ice shell perhaps 50 miles (80 km) thick, the satellite also harbors a huge subsurface ocean that contains more water than all of Earth's seas combined. This ocean is in contact with Europa's rocky mantle, making possible a range of interesting and complex chemical reactions, researchers say. The $2 billion Europa mission, which does not have an official name yet, aims to investigate the habitability of the moon and its ocean. The probe would then perform 45 flybys of Europa over the next 2.5 years or so, studying the satellite with high-resolution cameras, a heat detector, ice-penetrating radar and other scientific gear. None of the nine already-announced instruments were designed to hunt for signs of life. But it's possible that a small deployable plume probe — which would fly through putative plumes of water vapor near Europa's south pole, which were detected in December 2012 but have yet to be confirmed by follow-up observations — could carry life-detecting gear. So could a penetrator, which would slam into Europa's ice shell at high speeds, or a lander, which would touch down softly. Europa's rough and rugged terrain — a complex jumble of big ice cliffs and crevasses — would make a soft landing extremely challenging, Green said, and surface work would be tough in the moon's high-radiation environment (though radiation levels aren't uniform across Europa, and analyses suggest that a lander could operate for extended periods in some locales, Green added). We'll all just have to wait and see if NASA will add these challenges to its Europa to-do list.